So, Martha’s first adventure and we get Shakespeare! There’s a lot to like about this episode. Ten is clearly enjoying himself on this one, and Martha does well for her first time travelling, don’t you think? Asking the important questions for us not in TV-land and getting timey-wimey explanations in return. Yes I like that Martha has a very down to earth and practical approach to time travel, and while she has just as much sense of wonder as Rose, there’s a bit more of – I don’t know, is it snobbish to say she feels more intellectual in how she takes in history? Less giggling, more cynical nodding. I don’t think it’s snobbish – true, maybe, but just another way to identify the differences between the companions I guess. Martha is better educated and a little more worldly than Rose, so showing Martha reacting quite differently to how we saw Rose reacting is reasonable. I also think it’s important that Martha raises the race question early, and that the Doctor answers it – it’s a little glib for him to suggest she just walk around like she own the place, because he’s speaking from white male privilege, but at the same time it is important to note that there were people of colour (if not as many as now) in British history, and it’s only a century of whitewashed movies and television that makes us think otherwise. Important that the race issue is addressed in the time travel stories, because pretending Martha isn’t black would be bizarre. I rather like her “not exactly white, in case you haven’t noticed” line because, let’s face it, the Doctor probably WOULDN’T think about that sort of thing. That’s something I did wonder about, wouldn’t Martha have stood out a little more than she did, not only because of her colour but because of what she was wearing? I would have thought both would have excited more reaction than they did. I’m quite happy to admit to be speaking from a lack of knowledge here, but I would have thought that London circa Shakespeare’s time would be pretty homogeneous so I’d love to be pointed to some sources that talk about the history we don’t see usually see in movies and TV, and perhaps our readers would like to as well (this is something I also wondered when watching the one episode of Merlin I’ve managed to catch)? I believe that there were certainly more faces of colour around in England in historical times than we are led to expect from 100 years of very whitewashed TV. Not common perhaps – but not especially extraordinary. I assume Shakespeare had to have met at least one black person in his life because, Othello. I did think it was cute that they framed Martha as Shakespeare’s ‘dark lady,’ one of the figures he wrote so many sonnets to. Giveaway ends March 31, 2012. SpecFaction NSW, organisers of the 2010 and 2011 Aurealis Awards, are delighted to announce the finalists for the 2011 Aurealis Awards. Judging Co-ordinator, Tehani Wessely, said that with over 700 entries across the thirteen categories, the judges had a difficult job. An after party will be held at Rydges, North Sydney, following the awards presentations. Accommodation is available at Rydges for $149 (room only) or $174 (including full buffet breakfast). To take advantage of these rates please use the code ‘Aurealis’ when making your booking. The 2011 Aurealis Awards are sponsored by HarperVoyager and Cosmos Magazine and proudly supported by Galaxy Bookshop. 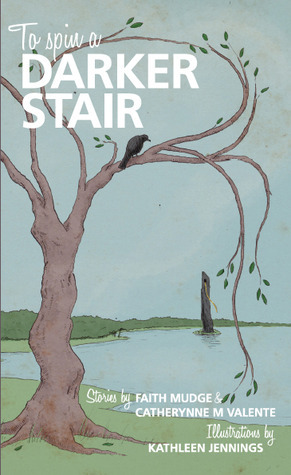 Last chance to pre-order To Spin a Darker Stair! I opened a parcel at work today, expecting it to be one of a zillion Fishpond books I’d ordered, and stared in some bewilderment at the cover of the gorgeous little book that came out – this was MY book, which is not printed yet! How did Fishpond get it?! And finally the penny dropped and I realised it was my proof copy of To Spin A Darker Stair! It’s a great conceit for me to call it MY book, because the credit for this beautiful little gift book belongs fully with the authors (Catherynne M Valente and Faith Mudge), the artist (Kathleen Jennings), and the designer (Amanda Rainey) – I did very little to make this book come to life. It is so pretty, and little and CUTE! There’s only a few hours left to pre-order your copy of To Spin A Darker Stair, which will be released at Swancon at Easter. RRP will be $8.95, but I’ve had a limited pre-order special for just $7.95 (INCLUDING POSTAGE!). As a special bonus, all pre-orders go in the draw to win the very excellent new novel from Margo Lanagan, Sea Hearts. Pre-order here!